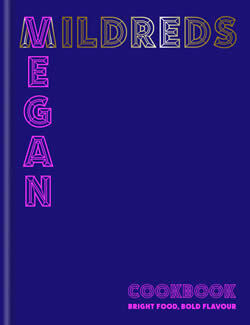 Bursting with clever ideas for feasts with family and friends, Mildreds Vegan Cookbook brings you a refreshing take on the conventional stereotype of vegan food. 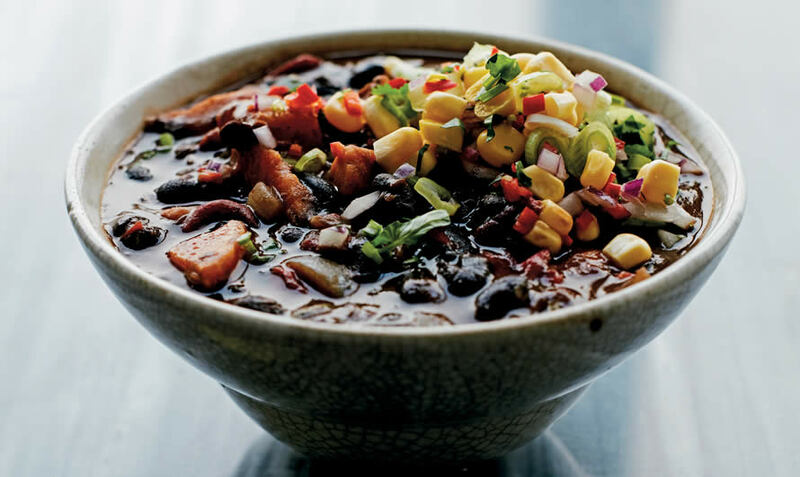 Black beans, a core ingredient in Brazilian cooking, have such a wonderful rich colour and taste that you don’t need to add a huge amount of other ingredients. Victor Passos, one of our Brazilian chefs, says that the bay leaves are key to an authentic Brazilian flavour and they certainly work well here. We’ve introduced a vibrant raw corn salsa to offset the rich flavour of the beans and add a dash of freshness and colour. 1 To make the soup, heat a big splash of oil in a saucepan, add the onions, chillies and garlic and sauté over a medium heat, stirring frequently, until the onions are translucent. 2 Add the spices and cook over a low heat, stirring, for 1–2 minutes, then add the beans with their liquid, stock and bay leaves to the pan and bring up to a very low simmer. 3 Add the peppers and sweet potato and cook gently, uncovered, for around 45 minutes, stirring occasionally, until the sweet potatoes are cooked but not disintegrating. Remove from the heat while you make the salsa. 4 To make the corn salsa, wash the corn cobs, then cut off the kernels by holding each cob upright with its base on the chopping board and slicing from the top downwards with a sharp knife. Don’t cut too close to the cob, as this part can be a bit fibrous. Add the corn kernels to a bowl with the remaining ingredients and mix to combine. 5 Before serving, transfer one-third of the soup (about 200ml/7fl oz) to a blender, or to a measuring jug for using a stick blender, and blend until smooth. Return to the pan and mix with the rest of the soup, then reheat, adding a little water to thin if necessary. 6 Serve the soup in bowls with a heaped tablespoon of corn salsa and a lime wedge. Available now in paperback Image credit: Matt Russell.